Courgette (or zucchini as it is known in the U.S and Italy) is in season in the UK between June and September. Part of the squash family, courgettes descended originally from the Americas but the type of courgettes that we are now familiar with were developed in Italy in the 1800s. The word zucchini comes from Italian, however the word we use, courgette, stems from the French word for squash courge. 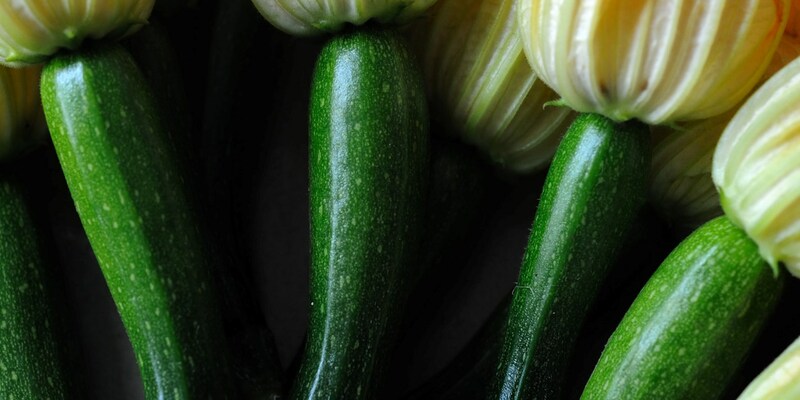 Dark green courgettes are the most familiar variety, but look out for white or yellow courgettes to liven up dishes or hunt down the flavourful trompette courgette, which is long and winding with a bulbous end – much like the musical instrument it is named after. A fully grown courgette is known as a marrow in the UK and can be up to a metre in length. Courgettes are very easy to grow and during the summer months. People tend to become overrun with them but fortunately there are so many ways to eat courgettes you should never get bored. Fortunately, they are low in calories and high in vitamins A and C, so they really are good for you too. When buying courgettes look for firm, shiny and unblemished fruits which feel heavier than they look when picked up. If they feel spongy this means they are past their best, so should be avoided. Courgettes will keep happily in the fridge for two to three days; any more than this and they will start to lose their flavour and become bitter. Courgette is one of the few vegetables that doesn’t require peeling before eating – just top and tail them then just a quick wash in cold water and they are ready to use. Courgettes can be eaten raw or cooked, sliced thinly and dressed with a little salt and olive oil for a great addition to salads, or you could try making courgette spaghetti by spiralizing. ‘Courgetti’, as it is now known, is even available in supermarkets ready-made, but making your own is much fresher and will have a better flavour. Try this Courgetti with Piccolo tomatoes, grilled corn and herb dressing for a simple midweek supper. When cooking courgette it is best to do so quickly. Grilling, barbecuing and frying are fast and easy ways to cook courgette. Avoid boiling or steaming as the courgette will soak up water and become mushy and unpleasant. You could, however, try adding courgettes to a soup – try Shaun Rankin’s Minestrone soup with courgettes which are added right at the end to keep a little crunch. The most popular way to cook courgettes is probably by frying or stir frying. Diced courgette takes literally minutes to fry and it is a main component of the French provencal dish ratatouille. Try William Drabble’s Griddled sea bass with provencal vegetables and basil oil to experience a great example of well-cooked courgettes. Courgette’s best friend must be cheese, Parmesan, feta, ricotta and many more all go hand-in-hand with this summer vegetable. Try William Drabble’s easy Pasta with courgette and Parmesan. Shaun Hill pairs courgette with sumptuous Gruyère in his Lamb rump with courgette moussaka, or you could try adding slices of courgette to a tasty pizza. Courgettes can also be used to make fritters when grated up and mixed with flour and eggs. They are also often used in breads and cakes to add moisture because of their high water content. Try these Courgette, cheddar and basil quick breads for a tasty snack, or for something sweet try these Courgette, chocolate and cardamom brownies.